In January 2016, Access Info Europe launched a campaign inviting members of the public to request the travel expenses of EU Commissioners. After all, it seems entirely reasonable to us that citizens be able to find out how much public officials spend and claim when on official trips and travel. It is public money being used on public business! But how did we get to this point? Check out the story of how we arrived at launching this campaign. What follows is how we carried out our campaign, giving you an idea of how to use the right of access to information and Alaveteli for advocacy, and the hard work behind it all. Since we had been able to establish that citizens could access individual Commissioners’ travel expenses for up to two-month periods (eg. 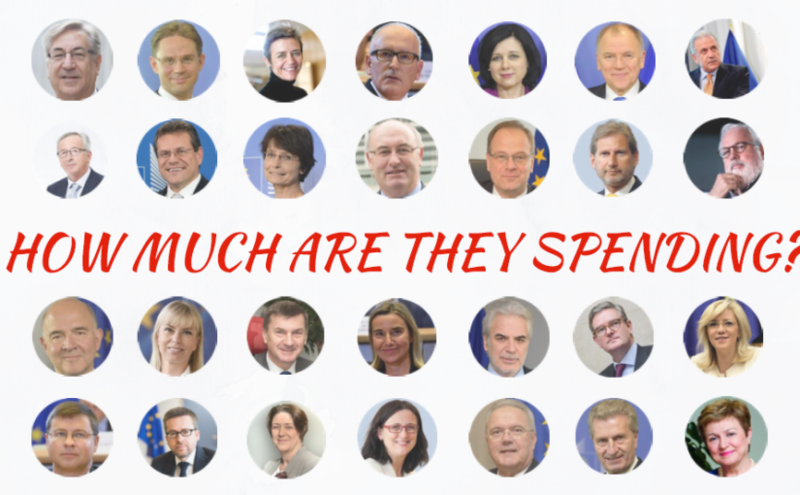 One request for Juncker’s January and February expenses, another request for his March and April expense, and so on), we calculated that citizens would need to submit 168 requests in order to access all 28 Commissioners’ travel expenses for one year. Now, this was not going to happen in an orderly fashion without some pre-planning. An open invitation to submit requests would be messy and lead to many duplications for popular Commissioners on the one hand, and omissions for less well known Commissioners on the other hand. So, using Alaveteli’s prewritten request feature, we set about drafting the 168 requests needed for citizens to request in full the 2016 travel expenses for all 28 Commissioners. As you can imagine, drafting 168 requests was ultimately the biggest and most labour-intensive part of the preparation that had to be done before launch. That said, it was also quite mechanical as we just needed to copy and paste the html text, changing the name of the commissioner and the dates accordingly. We then set about creating a webpage to host the campaign – thanks to the hard work of our communications team – which people could use to submit the travel expenses requests in a way that was simple and easy to navigate. Individuals would click on a ‘submit’ button and would be taken to the AsktheEU.org webpage which would contain the pre-scripted request that would then enable them to submit it like any other request. Our biggest obstacle was the fact that this webpage did not automatically update when people clicked on the ‘submit’ buttons (to avoid duplicate requests), so we had to devise a way to do this manually. That way, throughout the campaign, we would check on AsktheEU.org when requests have been submitted (we tagged the prewritten requests so it made it easier to track them), mark on the board the Commissioner and their two-month period requested, and then manually delete the automatic link on the webpage to the prewritten request to avoid any duplications. With the system in place, we were ready for launch. In fact, this system went so smoothly that despite a limited number of duplications, we have been approached multiple times to explain how we managed to programme an automatic system (sorry everyone, it was all done manually)! A large part of ensuring many people submitted requests was to make sure the word got out, especially to our civil society partners and media supporters across the EU. 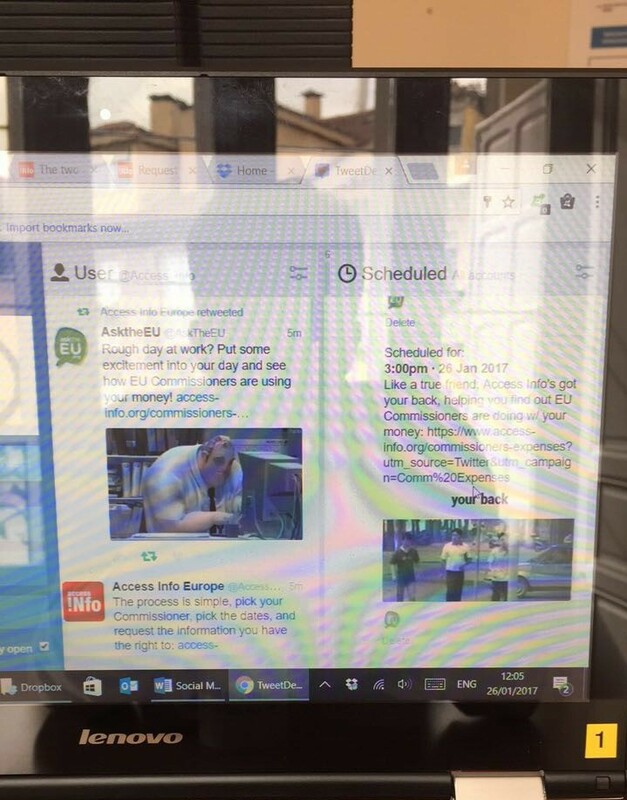 This meant writing to key civil society partners and supporters to enable them to be ready to take part, preparing tweets on both our Access Info and AsktheEU.org accounts, in addition to preparing a Facebook post. We also were in contact with European media outlets so that they could also mention our campaign in their news to help reach a broader audience. There are few things that can bring so many diverse people together like a good gif. Launch day – All hands on deck! We were nervous but excited on launch day – the morning of Thursday 26 January 2017 – would people submit requests? would we get overwhelmed with the manual processes? Will the Commission disclose all the documents finally?! Upon launch, we contacted our mailing lists, we tweeted, we retweeted, we facebooked, and we emailed partners and colleagues across Europe so that all 168 requests were submitted by the end of the working day on Friday 27 January 2017. In just two days, 120 people made 189 requests (ok, so there were 21 duplicate requests – demonstrating that people were really interested in accessing the travel expenses data)! Our manual system worked too. 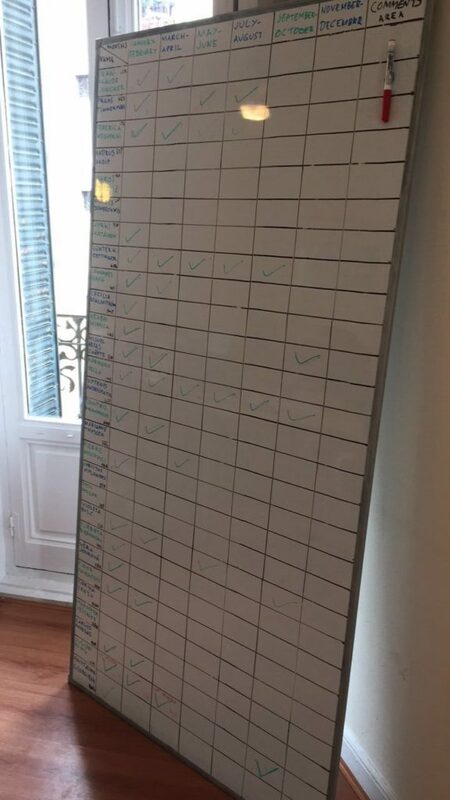 Whilst someone would refresh the search page on AsktheEU.org to check newly-submitted requests (we discovered that the admin side of the website was quicker at updating than the public search page), someone else would update the white board and then someone else would update the webpage. In addition to that, we continued to get the word out about our campaign. When other organizations and journalists responded to our tweets, we responded back and interacted with them. This kind of encapsulated much of what happen during the day. It was a lot of fun, overall, especially when we were able to get up and check off a box on the whiteboard, leading to cheers from all around. Now the ball is in the EU’s court, and while they must be the ones to disclose the information in due time, it is also up to us to keep up the pressure to make sure they do so. And that’s something you can count on us for; since the Commission is unwilling to fulfill its obligation, we will be taking a complaint to the Ombudsman to ensure that citizens’ rights are fulfilled and they get access to the information they want to access! If you want to learn more about our campaign, click here. Be sure to stay tuned for news on the EU response to our requests! Campaign led by Access Info Europe.